Zoetrope is an an animated vintage toy that was originally developed in 1830s. The Zoetrope has recently been a major feature in the film, "The Woman In Black" starring Daniel Radcliffe. 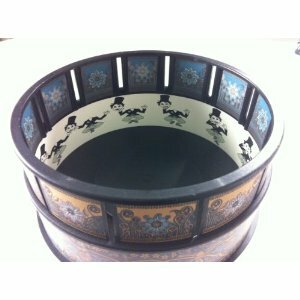 This is a modern replica of a traditional Zoetrope. A zoetrope is a device that produces the illusion of motion from a rapid succession of static pictures. Just insert an animation strip, spin the drum and look through the slots. The pictures instantly spring to life! Eagles flap, Orcas dive, frogs jump and more! Change the 18 included picture strips at will. Then, try sketching on the six included Draw-Your-Own strips. Anyone can be an animator! Our Zoetrope's compact elegance and smooth performance remains unmatched in the world of animation toys. Originally designed by Fred DaMert and Bill Hanlon in 1992 and sold by the DaMert Company, this timeless favorite has been off the market for years. Now, with Fred's blessing, we've proudly brought it back. Not only did we use the original tooling to make this durable plastic toy, we've faithfully reproduced and included the original twelve picture strips designed by celebrated animator Ruth Hayes. And that's not all. We've added six NEW picture strips and six "Draw-Your-Own strips!" The included instruction booklet provides a history of this classic invention, explains how it works, and tells you how to bring your own drawings to life.